While remaking for the millionth time my list of must have baby products today, I kept thinking what are the products I'll use the most and 2 things kept coming to my mind one for when at home and the second for when exploring the world, shopping, exercising, etc. So inside the house there is 2 things I'm actually convinced I need, a crib/pack&play and a pacifier (Hate me, if you must, but even if it's 10 mins a day I need them) and then I started planning in my head our outside adventures and several things kept coming to my mind: car seat and diaper bag, stroller and diaper bag , sling and diaper bag, carrier and diaper bag, dad and diaper bag. Can you find a pattern here? It doesn't matter how you plan to take your baby to meet the world outside, you will need different types of gear but one item will still be always needed : "the diaper bag" Moms to be and moms think about everything from: bottom rash cream to the new swing they want to purchase, yet everyone forgets or leaves for the last minute picking a diaper bag. After 2 babies I know exactly what I want, now where to find it can be complicated. I want a big bag with tons of pockets, I need to hold 1 change of cloths, diapers, towels, burp clothes, something to cover while I breastfeed, toys, pacifier, sunscreen, teether, baby sling just in case, hat, a hidden place for dirty diapers, my makeup bag, my wallet, my keys, my phone, my world. Yes! it has to be big yet allow me to organize everything. 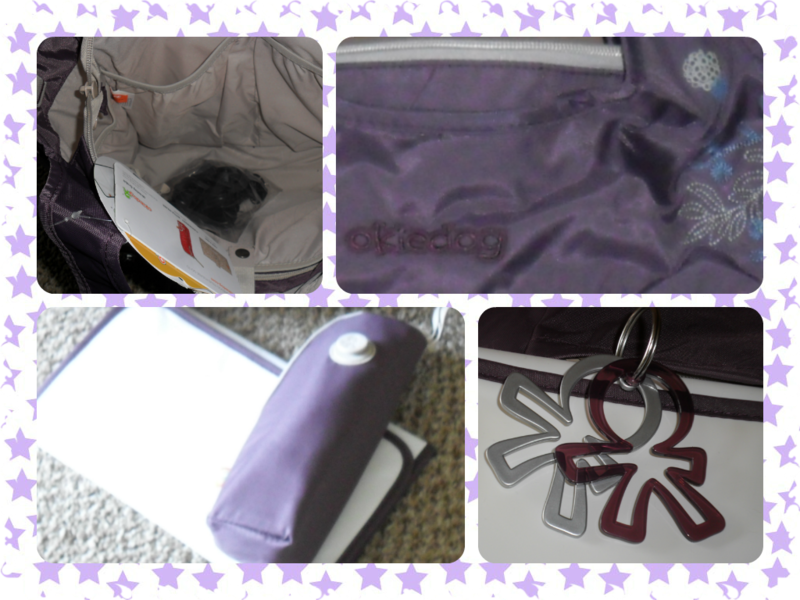 Okidog was my heaven-sent answer, I stumble upon the company as always in google searches, I was looking for a diaper bag to hold all my world and share adventures with. I must say the bag designs are gorgeous, they have so many colors and sizes, there is a dream diaper bag for everyone. The amazing people from Okidog sent me a beautiful big - big bag to review, The design is called Celeb Tote and the model is Sidamo, the bag came in a raspberry color with a lovely and subtle embroidery detail. 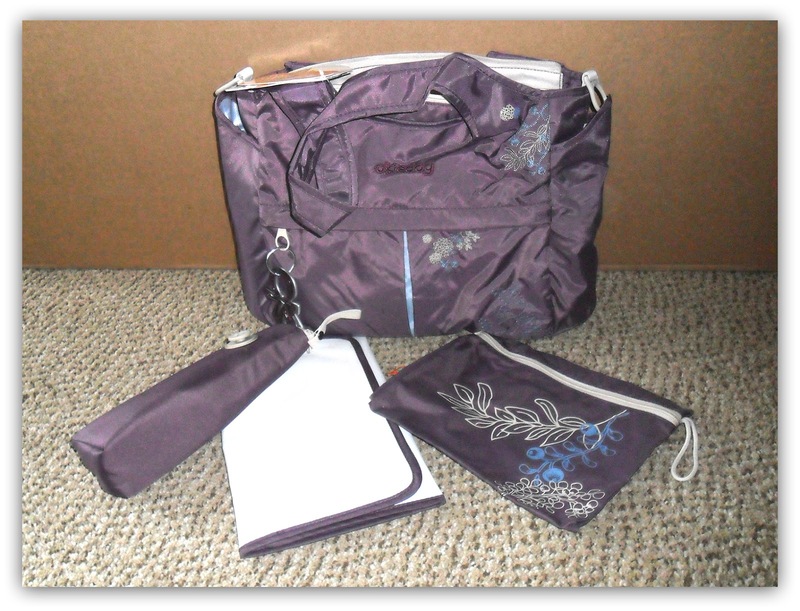 The bag has several pockets and areas to avoid clutter and keep everything organized. 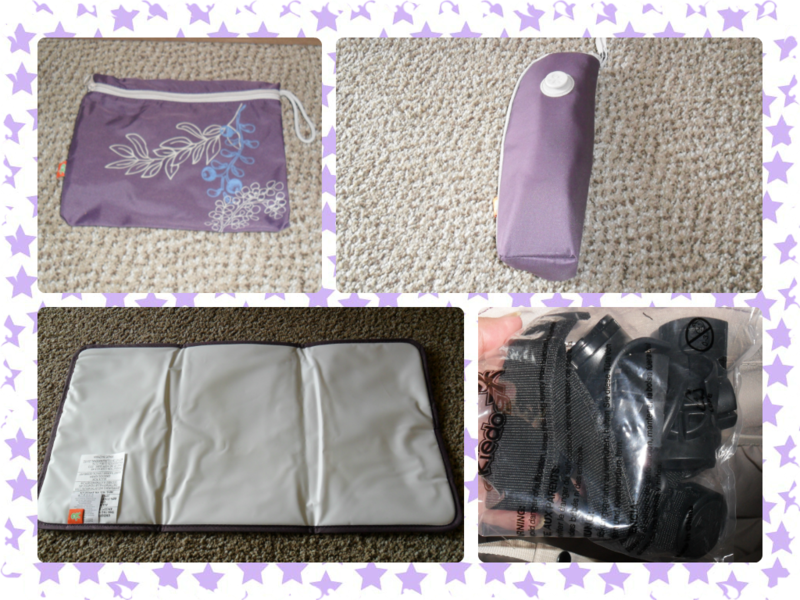 In the front you can find a zippered pocket with a nice key-holder and room for your wallet and phone, in the back there is big compartment to hold your changing mat and in case of an emergency a dirty diaper. There are pockets in both sides perfect for a bottle (one of them insulated), small toys, diaper rash ointment , baby powder or towelettes. the main bag area can be closed with a zipper and has pockets in the back and the front. The bag itself is perfect to carry everything your baby could need, however every Okidog bag has a few accessories to take it from a great diaper bag to must have mommy product, like: an antibacterial portable changing mat, insulated feeding bottle holder, a matching accessories extra bag and a set of stroller clips and hooks. If there is one item in our babies life which could keep a diary of all their adventures, triumphs and miss-happens it has to be the under-appreciated diaper bag, this multitasker works in many cases as purse, toy bag, tote, beach bag and travel bag. Okiedog bags are designed to last, are lightweight, easy to carry and you can pick a diaper bag without sacrificing your style. Okiedog products are: PVC-, Phthalate-, AZO- and BPA- free. Okidog not only offer's diaper bags but also children's: backpacks, purses, suitcases, art cases, stroller bags, cup holders. For parents: Ipad & document holders, saddle bags and more stylish diaper bags deluxe collection. That is a really nice looking diaper bag. Much nicer than the one I had when my boys were babies. Agreed - looks more like something dad can handle carrying too! So many bags are so feminine dad wants to run and hide! What a cute diaper bag! We just got out of the diaper bag phase and mine was HUGE!! That's a great looking diaper bag! I remember how happy I was when I found the *perfect* diaper bag. This one looks awesome! Cute bag and very convenient. I wish I had a diaper bag like this when I was needing one ! I wish I had a diaper bag like this when my kids were babies! Love that it comes with an antibacterial changing pad. Such a cute diaper bag! I agree that a diaper bag is one thing I would not be able to accidentally forget at the house...it has everything I need for my kiddos in it! That looks like a practical bag to tote around. I love that diaper bags these days aren't overly baby-ish. When my kids were babies, I remember carrying around a Winnie the Pooh diaper bag I got as a shower gift. I wasn't overly fond of it. Love the bag! Looks like it serves many purposes! So happy I am over that stage but I will say, I like these. Will have to share. Cute diaper bag. I looked at so many diaper bags when my son was born and never found one that I really liked. I love a good diaper bag to store all my babies'diapers, clothing, food and snacks. 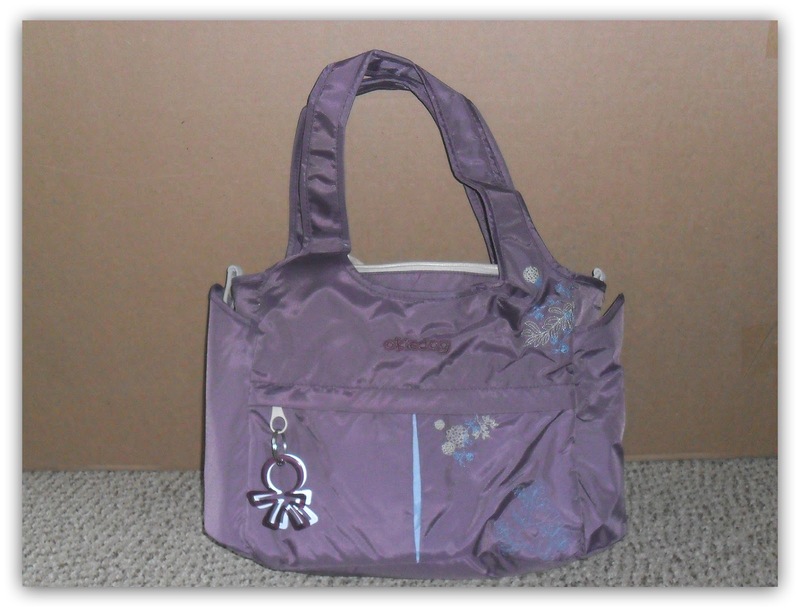 A diaper bag for a new mom is a huge must, especially one like you said with tons of big pockets. This one sounds great and I hope you get great use of it. Looks like a nice back, nice and spacious! No need for a diaper bag yet but this looks great!! I like the separate bags that tuck inside. This is really nice! My son is three and I still have to have a diaper bag. I could use a new one and I will have to look into this one. That looks like a very cool diaper bag! Very spacious too. What a cute diaper bag! I love that it includes the matching accessories, so you don't have to purchase them separate. This would make a great baby shower gift. Always on the lookout for a fabulous diaper bag. So nice when they come with useful accessories! That bag is cute! Even though it's a diaper bag, I would totally use it for my yarn! Oh that's cute, I like that one!